Scallions vs Chives just how different are they and can you use one in place of the other? It’s important that you use the correct ingredient in your recipe for while they may appear similar when you look at them, they will have drastically different effects on your final meal. While both scallions and chives are alliums, they are different species and will bring different flavors to your cooking. This means that you need to make sure that you are using each one properly to enjoy all of the smells and delightful flavor that they will provide. Scallions are actually very young onions that have a tiny white base that has not yet matured into a bulb and is topped with green stalks that look similar to chives. You can use the whole scallion and don’t have to worry about cooking it as there is no harm in eating it raw. These plants are very mild when compared to fully mature onions and tend to be a lot sweeter. 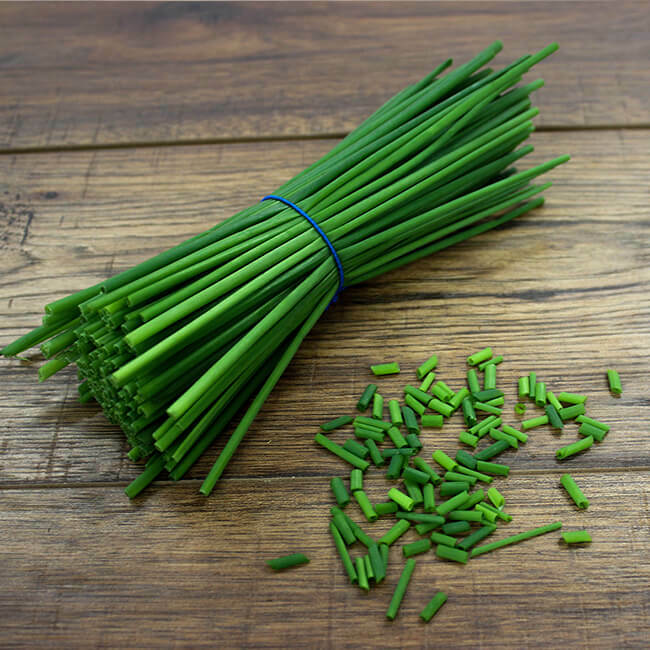 The whole of the scallion will hold more flavor than the green leaves will and many people think that they can swap chopped green scallions for chives. When choosing scallions, make sure that you buy bunches that are medium in size with very firm white bases and stiff green ends. Any sign of wilting or a mushy white part of the scallion means that it is past its prime and will not taste as it should. Store the scallions in the vegetable drawer of your refrigerator, wrapped in a damp paper towel and sealed in a plastic bag for up to three days. Any longer than that and you risk the scallion molding. Chives, while also an allium, are not a type of onion the way that scallions are. They are an herb that grows from a bulb but just the green part or the flowers should be eaten. Chives are incredibly easy to grow and offer a very bright burst of flavor and aroma to dishes when added at the end of cooking so that the flavor is not dulled. They do taste a little similar to onion, but not as strong as scallions do, and also have a hint of garlic when used properly.It’s important that you only use fresh chives in your cooking as ones that are past their prime will not taste very good and will not be visually appealing. Since they are often used as a garnish, you need to buy chives that are bright green without any blemishes and have a strong yet pleasant smell. Any chives that are wilting will feel soft in the mouth and won’t smell nearly as good. Stored properly, they will last around a week in the refrigerator before turning bad. Used correctly, both chives and scallions will improve your cooking but it’s important that you use them in the right applications to get the most out of your food. For a sharper and more pronounced flavor, you need to opt for scallions while chives are a lot more subtle and have more flavors combined to enhance your food. Either way, bright green scallions and chives can improve the appearance and the taste of your meals. « Chives vs Green Onion – What’s the difference?